PTT Aromatics and Refining Public Company Limited (PTTAR) has a refinery (AR1) and two aromatics plants (AR2&3) at the Map Ta Phut Industrial Estate in Rayong, Thailand. These are very large-scale plants, capable of refining 280,000 barrels of oil per day and producing 2.26 million tones of aromatics per year. 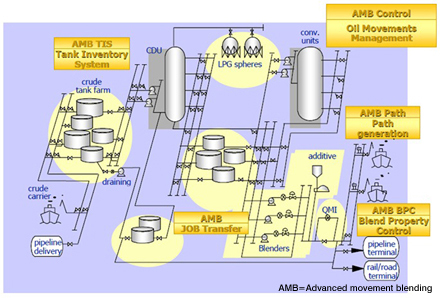 An oil movement system (OMS) manages all pipelines, crude oil storage tanks, and LPG storage spheres in the tank farm area and controls the movement of all intermediate components and finished products. A storage and handling unit receives and handles products from the process units, imported crude oil, imported condensate for AR2&3, imported fuel oil, and export fuel oil, and also delivers products to the jetty, pipeline, road, and rail. Various grades of fuel oil are produced in the storage and handling unit by blending intermediate component products. The blending process has its own quality measurement instrument (QMI) validation system to control the quality of the product blends.The AR1 refinery recently replaced its legacy DCS with Yokogawa's CENTUM CS 3000 and has been successfully using this to control the oil movement system as well all refinery plant facilities, with no major problems. AR1 is looking now to introduce Yokogawa's APC and Exapilot solutions to improve product quality and production efficiency. 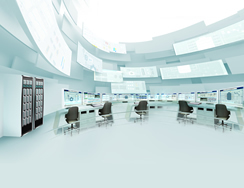 OMS systems allow for a more intelligent alarming approach that goes beyond the simple detection of high and low levels. When meters are not available, flows can be estimated from inventory changes and used to ensure that maximum loading rates are not exceeded. Excessive tank drainage can be avoided, preventing product loss or contamination. Leak detection methods can be applied. Slopping can often occur inadvertently, without any changes in metered flows. This can occur after start-ups or large upsets, when valves may be left cracked open by one shift and remain unnoticed. Monitoring for changes in slop production rate in the tank area can draw attention to the problemand provide diagnostic aids to identify the source. One advantage of OMS automation is that it brings the discipline to properly document routings, usually in the form of operator graphics. Most systems also have the necessary logic to identify all feasibleroutings and detect conflicts. The issuance of an alarm when there is a change in the tank level will cause an operator to check whether the product movement was unplanned or whether there is some other cause, such as someone simply forgetting to enter the movement plan. By continuously reconciling source and destination inventories with tank to tank transfers, it is possible to detect whether product is wrongly leaving or entering the transfer. Reconciling change in inventory against integrated process flow meters will detect if product rundowns have been misrouted. A major potential source of oil loss is the overestimation of imports and underestimation of exports. Within OMS systems, many measurements can be cross-validated. Loading meters are automatically checked against tank levels. Statistical methods can be applied to check and calibrate meters. Careful analysis has shown that when a tank farm is automated, it is possible to make optimal use of existing inventory and also to expand refinery operations without increasing the number of tanks. Operators can observe and monitor movements throughout the plant. Green indicates a safely running operation. 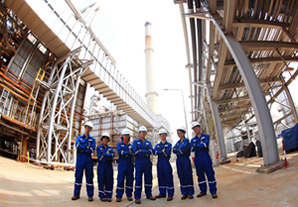 Chalongchai Banglap, the Refinery Senior Process Control Engineer, said, "The system allows operators to clearly see the plant's status and know what is going on. 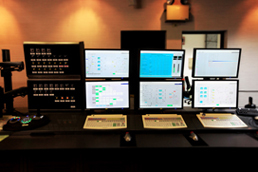 With this OMS, our operators can take quick action whenever an action is needed. Our plant is now very safely operated without any losses of raw materials or products. We are very pleased with the performance of Yokogawa's CENTUM CS 3000 and the related package software. Yokogawa is one of our best partners." The open, state-of-the-art system architecture."